Smiling like the Cheshire cat, Tim got a chance to tick an item off his bucket list when he went Skydiving at Skydive Nagambie. Actually, to say he was excited was an understatement. As a surprise for his 40th Birthday, the family organised a gift certificate and we are still talking about what an awesome experience it was! Not just for Tim, but for all of us! In terms of a customer service experience the team at Skydive Nagambie were faultless. From the initial phone contact to walking out the door after the jump the experience was everything we could have hoped for! Skydive Nagambie is located in Victoria about an hour and half north of Melbourne. They specialise in taking people for their first skydiving experience and having resident skydivers means that the passionate atmosphere you experience is authentic and leaves you wanting more! On arrival we were met by Steve, Tim’s tandem instructor, and were immediately made to feel at ease. After filling out some paperwork, Tim was introduced to Joey his photographer / videographer and Steve went through a pre-flight briefing and safety presentation and fitted Tim with his harness. Twenty minutes later, Tim, Steve and Joey along with about 10 other skydivers were in Skydive Nagambie’s XL 750 turbine aircraft heading up to 15,000 feet. On board the plane, Tim talked with Steve about his skydiving adventures. For 20 minutes they travelled until they finally reached 15,000 feet and it was time to jump! With the cold wind in Tim’s face, Steve counted down ..3..2..1..Skydive! and they were out of the plane, freefalling for around a minute until Steve released the main parachute. 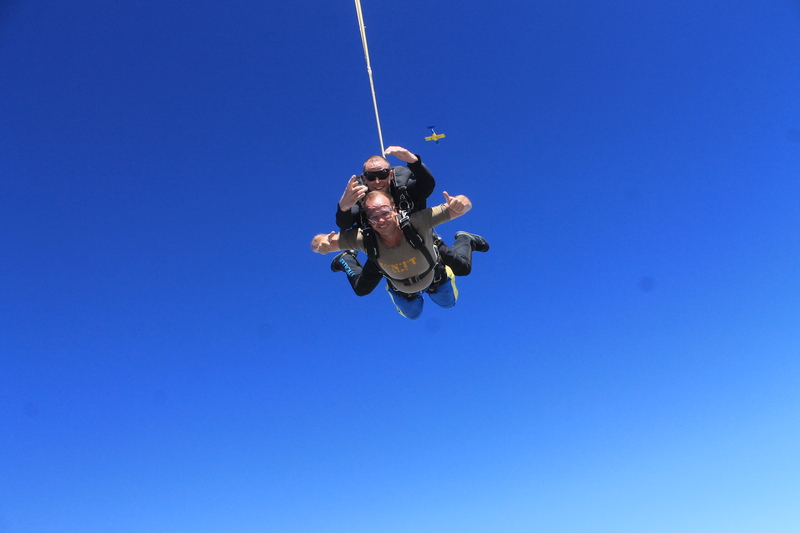 I will never forget the sound the air makes as you freefall after leaving the plane. It is intense and I guess you could liken it to putting your head out the window when the car is going 200km per hour! It is an awesome assault to your senses and then once the ripcord is pulled it is immediately silent. An awesome experience that I will never forget. I want to jump again – I would love to do the course so I jump solo! On the ground, Georgina, Alegría and Isaac watched on as the plane became a speck in the sky and waited for about 25 minutes until parachutes started to become visible as they were headed to the Drop Zone. They were on the lookout for a blue and white parachute and after a false alarm they spotted Tim and Steve! Landing safely, Alegría waited for her Daddy to get out of the harness and ran lovingly into his arms excited to hear all about “flying in the sky! What struck me about the whole experience was just how friendly everyone was. Having the kids there was no trouble – there is a canteen where delicious home cooked snacks and meals are available and the toilets are well maintained and clean. Both children got special attention, whether it was a staff member asking Alegría how old she was and all about what sort of party she wanted (and could he come if he wore a tutu?) to the “hey, little dude” , “G’day mate” and high-five’s that came Isaac’s way. 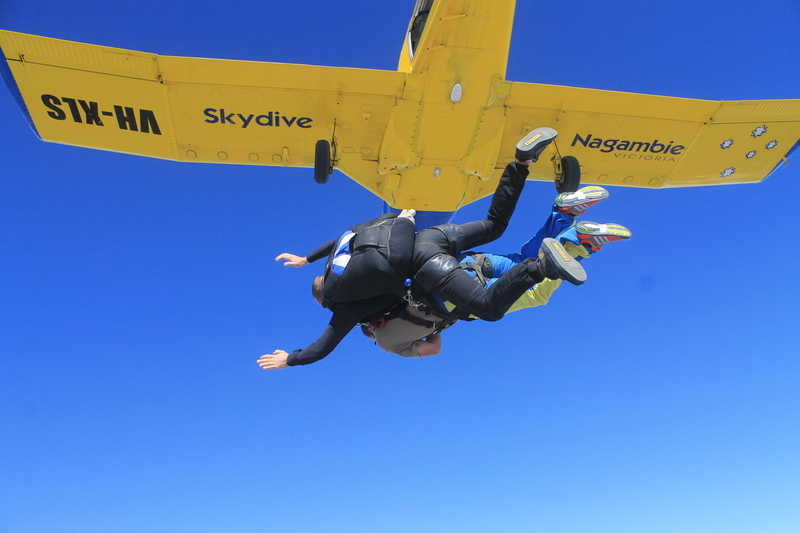 We had such an awesome time at Nagambie Skydive and can’t wait to visit them again one day*! * We did visit them again when Georgina completed her first jump … but that’s another story! Tim is still dreaming of his next jump!